Parks and Recreation Ontario is a non-profit association that advances the health, social and environmental benefits of quality recreation and parks through evidence-based practices, resources and collaborative partnerships. PRO is proud to present our 2019 Award of Excellence winners. These organizations and individuals have worked tirelessly to create the best programs, services, and facilities for their communities. We applaud their accomplishments and invite you to join us in honouring them at the 2019 PRO Forum. The Ontario government has has announced a review of regional governance. PRO is actively working to support the municipalities affected by the review. Read a primer paper and summary of a roundtable discussion held at the 2019 PRO Educational Forum. 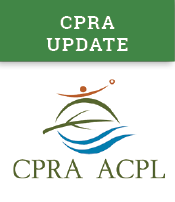 The Ontario government has recently posted proposed regulations affecting recreation. Read information on Rowan's Law regulations and changes to authorized recreation and skill-building programs for children ages 4-12. Read PRO's submission on Rowan's Law. PRO is pleased to announce that applications are now being accepted for the 2019 Green Jobs Initiative. Are you looking to hire a student for new green position? Municipalities, indigenous communities and other sector organizations can apply online for a wage subsidy of up to $5712 for each student. Before we know it, all the snow will be gone and it will be June! Check out the new home of June is Recreation and Parks Month right here on the PRO website. Download the new logo & 2019 calendar! New Municipal Councils have been sworn in across Ontario. Download a copy of PRO's Municipal Council Orientation Toolkit and new Training Webinar - designed especially for elected officials - to help you build a strong case for parks and recreation in your municipality.